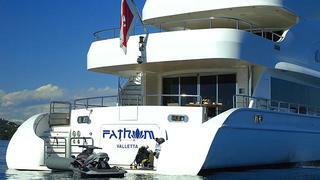 A 45-meter super-yacht that journeys to the most exotic locales, motor yacht Fathom is also a destination in and of itself. 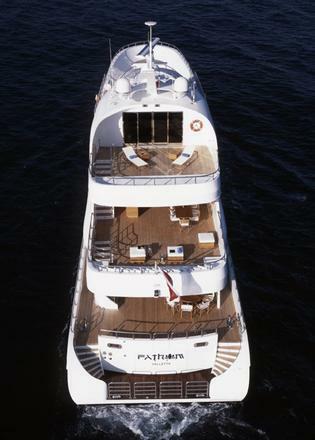 Derived from the old English word FAEOM, Fathom depicts the embracing arms of Da Vinci's Vitruvian man which welcomes and embraces guests within the luxury and comfort of this tri-deck super yacht. 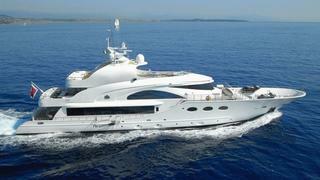 Superyacht Fathom’s incredibly pristine white hull is packed with a 417 gross tonnage of sheer class and luxury. 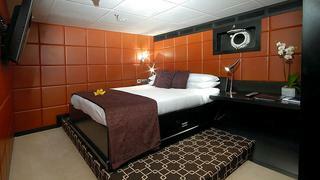 Down on the lower deck are four glamorous guest cabins accessed via a LED-lit hallway. Each with their own ensuite, the staterooms have been styled with exotic décor, clad in bamboo, leather panels and red handmade rice wallpaper. 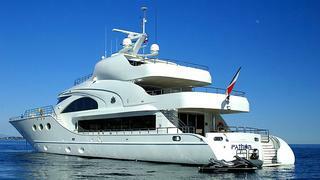 She can now comfortably accommodate 10 guests into 5 cabins (instead of 8 guests into 4 cabins) as the office has been converted to a nanny/children stateroom and a shower has been added in the day head. 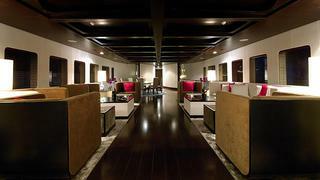 Moving directly up a level, the main saloon has been styled to an award winning Mark Zeff design. Zeff Design’s choice of materials are second to none, incorporating the highest quality stunning silk wall panels, the softest of leathers, rich wood finishes, hand-knotted silk carpets and a marble-topped dining table. 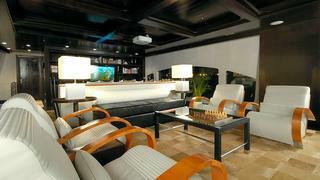 Creating the feel of a luxuriously appointed home, sumptuous seating, a large screen TV and a full length dining table make this the perfect space to relax or entertain. The entire width and forward of the main deck is dedicated purely to the master suite, with walls bathed in white silk, luxurious fabrics and divine linen. 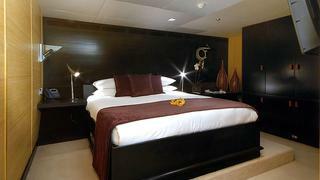 Her king-sized bed that hides a retractable plasma-screen TV in the footboard is positioned in the centre of the room. Behind the centrepiece is a duo of exquisite walk-in dressing areas along with a spa-like bathroom featuring marble walls, and a soothing river-rock floor. 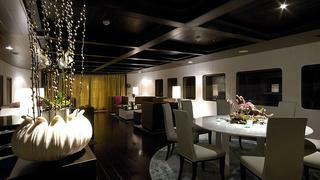 The upper deck, home to the fly bridge and Captain’s cabin, boasts another lounge embellished with hand-stitched cowhide rugs and an array of mahogany cabinets filled with nautical antiques. Technology has been mastered down to a tee with an integrated sound system with full exterior network and multiple iPod docking stations. 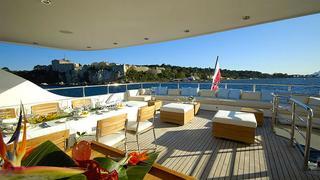 Boasting three exceptional decks, Fathom is the ideal yacht for al fresco dining, relaxing or bathing. 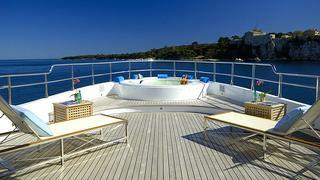 With ample seating, sunpads aplenty and a five-seater Jacuzzi, the sun deck offers the perfect setting for catching some rays or enjoying cocktails as the sunsets. With a fully equipped gym also found on the sun deck, there really is no better place to work out whilst taking in the breath-taking views. Armed with an abundance of toys from paddle boards to WaveRunners, and snorkelling equipment to fishing equipment, Fathom meets all personality requirements.